PVC is a rigid material that is chemically nonreactive. It can be easily heat-formed, welded or solvent-cemented. In addition, it can be machined using standard metalworking tools to close tolerances and finishes. 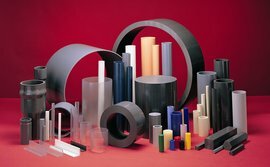 PVC has a broad range of applications, from high-volume construction-related products to simple electric-wire insulation and coatings. PVC resins are normally mixed with other additives, such as impact modifiers and stabilizers, resulting in hundreds of PVC-based materials with a variety of engineering properties. PVC accepts paint and performs well under most silk-screening processes. It also is tasteless, odorless, and nontoxic. Type I PVC is a normal-impact, highly corrosion-resistant material with exceptional chemical resistance. It is ideal for applications with high concentrations of acid and alkali, where normal working temperatures are relatively low, and where the application environment is not subject to excessive physical abuse. Standard color is gray; also available in clear and white. ​Type II PVC has excellent thermoforming capabilities, contour definition, and surface texture. It also is hot and cold formable and absorbs little moisture. Type II PVC has greater impact values and lower chemical resistance than Type I.